I find this dial, and the device generally, perplexing. First about the device: it's made of metal and glass. I know it can survive being inserted and left inside a roast (beef, lamb) in the oven. But I am less sure whether the reading is accurate in this case. Do I have to take the dish out, insert the thermometer, wait a few seconds, and repeat? Or can I simply peak and close the oven again? Now about the dial. I think that it's saying one should cook beef until 140 for rare, and until 160 for medium. It also says to cook poultry to at least 180 for safety, and not much more to avoid poultry drying. What kind of summary is the "170" ----- "Lamb; Beef: well; Veal, Pork" inscription trying to say? 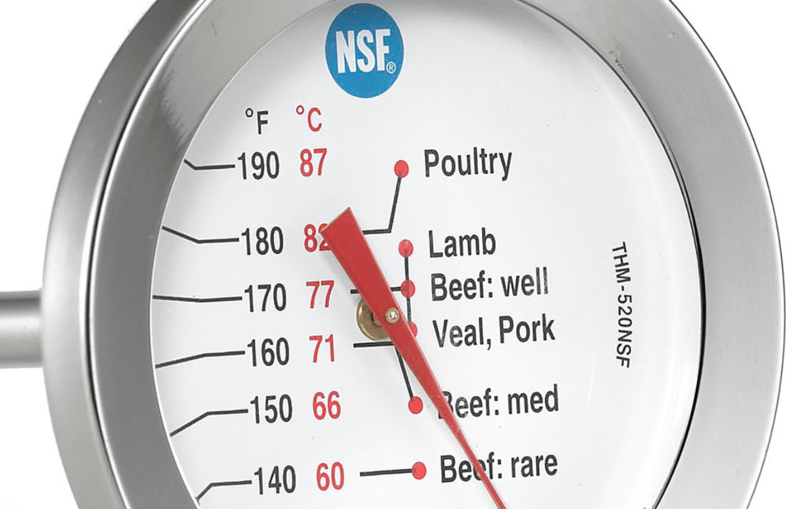 This kind of thermometer is intended to remain in the piece of meat (or whatever) and delivers an accurate 1 reading during roasting without further procedure. Just stick it in the part of your roast that will heat up slowest, typically the middle of the thickest part. Avoid the bones, this may give false readings. If you have an oven with a glass door, you can even check the temperature without opening the door. Opening the door can lower the oven temperature, especially if you want to take multiple readings when getting close to the desired temperature. They are usually a bit slower than those instant-read ones you use for a quick reading, so if you want to use them for a “poke-and-read” measure, give it a moment to adjust. The values on the scale are what the manufacturer deemed appropriate for a certain type of meat, in your example 170 F for lamb, pork and well-done beef. If you disagree with them, simply ignore the labels and go by the numbers. (Which I personally would do in this case, they seem a bit on the “safe” - or dry - side.) And remember to factor in carry-over cooking during resting. 1 It’s always a good idea to test a new thermometer, but here the boiling water method won’t work. If you have it, do a cross-check with another calibrated thermometer. There’s a third type of thermometer combining the ease of use (“stick it in and watch the temperature rising during roasting”) with a few extras modern electronics can bring: The electronic temperature probe that is connected to some other device, sometimes the oven itself, sometimes some external alarm/timer thingy (I have one and like it), or even connected to a smartphone app (random example), so that you can even leave the kitchen and still can check the temperature. The simpler ones are in the same price range as your fully mechanical specimen. Not the answer you're looking for? Browse other questions tagged roasting thermometer or ask your own question.